What kind of information society do you want? How should we reduce the amount of misinformation? How can we protect democracy from digital damage? How can we help people make the most of the extraordinary opportunities of the Internet while avoiding the harm it can cause? 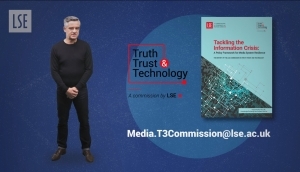 For a year the LSE Truth, Trust and Technology Commission (T3) has been grappling with these key questions. 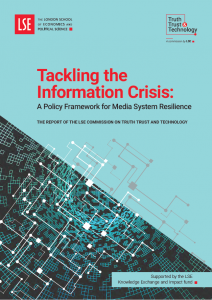 Sparked by the anxieties caused by so-called fake news, the Commission has now come up with a policy agenda for tackling the information crisis. Working with politicians, technologists, journalists, academics and others from a range of sectors and the general public, we have published this report that sets out a wide-ranging strategy to build a more resilient media system fit for the information ecosystem in the UK. The key proposal is for an Independent Platform Agency (IPA) that would be a watchdog – rather than a regulator – which evaluates the effectiveness of platform self-regulation and the development of quality journalism, reporting to Parliament and offering policy advice. It should be funded by a new levy on UK social media and search advertising revenue. The Agency should be a permanent forum for monitoring and reviewing the behaviour of online platforms and provide annual reviews of ‘the state of disinformation’. The report also suggests ways to support the traditional news industry to develop innovative ways to combat the information crisis. The report also addresses the recent problems around media and elections in the UK. It recommends that Parliament urgently brings forward legislation to introduce a statutory code on political advertising, as recommended by the Information Commissioner. The central message from this report is that the information crisis is causing real problems – in health for example, as well as politics. Any approach to deal with it must be structural because this is a systematic problem that needs a coordinated, comprehensive response. This is a rapidly evolving set of issues so any policies must also be flexible. Above all, they must avoid causing any damage to the diversity and openness of debate and freedom of expression. 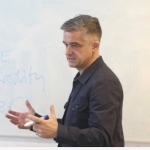 The LSE T3 Commission will continue its work on this and welcomes your input. You can access the background papers and a range of online resources at our website. There is an introductory video here.